Velocity, The University of Waterloo’s start-up incubator, is introducing a major change in the way it will be funding its pitch competitions. Ever since they were established in 2011, the three competitions held annually offered the four winners grants of $25,000 each. Now, Velocity will be using a model based on the Y Combinator’s post-money SAFE (Simple Agreement for Future Equity) and is seeking to raise more than $1 million for an investment fund slated to launch this month. Each future winner will receive $50,000 — as an equity investment. With three pitch competitions a year each paying out four prizes, Velocity has been paying out more than $300,000 per year in grants. This new investment fund will replace all those grants. For the cohort of start-ups that won grants in the pitch competitions between 2011 and 2013, hypothetical equity investments would have earned 57% annualized returns, according to Velocity. 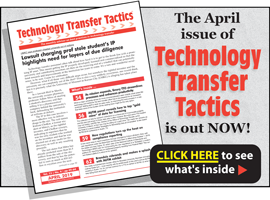 A detailed article on Velocity’s shift to post-money SAFE investments in its start-ups appears in the March issue of Technology Transfer Tactics. To subscribe and access the full article, along with the publication’s 12-year archive of best practices and success strategies for TTOs, CLICK HERE. Volumes 1 and 2 of Best Practices at University-Linked Business Incubators and Accelerators: Cases Studies 2018 are now available at a special discounted rate . For complete details, CLICK HERE.